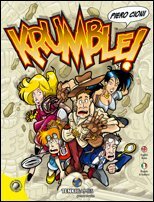 A game which attracted me by its nice, comic-style looks was Krumble! by the small italian publisher TENKIGAMES. The game actually is a perfect example for the high quality of graphics which even small, rather unknown publishers reach these days, but the good looks of the game also made me interested whether it would be interesting to play as well. At the start of the game three rows of temple tiles (rooms) are aligned on the table, with the size of these rows depending on the number of players participating. Each of the temple tiles used has two entrances and two exiting doorways, and the temple tiles all must be aligned in a way so that the exit doorways always point into the same direction - the escape direction. 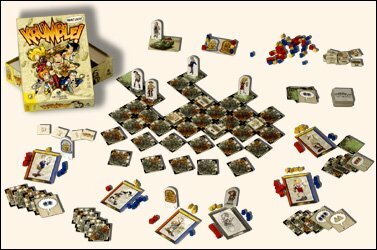 Each of the players places his playing piece in one of the rooms at the first row, and furthermore each player receives a character card and six coloured energy counters for each of his adventurer's abilities (Strength, Agility and Knowledge). During the game, the energy level for each of these abilities may never be above 6 or below zero. It will be the aim of the players to get out of the temple with as much energy counters as possible, since the player with the highest total of counters will win the game! Finally, each player receives one temple tile showing a temple-exit and four additional randomly drawn temple tiles, and once all needed counters have been placed at hand the game may start. The players take turns (with the last player becoming the new start player after a round has been played), and during his turn a player may decide either to make a movement or rest. If a player moves, he must first draw a temple tile, then play a temple tile from his hand by adding it to the temple laid on the table, then move his playing piece one room and finally check whether a "crumble" takes placed. If, on the other hand, a player decides to rest, he draws two temple tile, plays one of them accordingly recovers some lost energy. When adding new tiles to the temple, the general layout must be kept, meaning that all new tiles also must be placed in a way so that their exit doorways point into the general escape direction. To move his playing piece onto a new temple tile, a player has to check the exit doorways of his current temple tile which kind of ability symbols are printed at the exit he wants to use. He has to pay the energy counters printed on the exit doorway in order to move his figure through the exit, and thus a player's energy slowly decreases unless he chooses to rest and refresh. The costs for moving into a new room may increase even more if another player has used an obstacle tile. Some of the tiles in the deck of temple tiles are no rooms but obstacles, and if such an obstacle is placed into an empty room it increases the energy costs a player needs to pay to enter the room. However, an obstacle also may be played at a room already containing one or more adventurers, but here the adventurers have a chance to avoid the payment of additional energy by rolling with one dice lower than their current energy level of the ability in question. Although unlikely, an explorer also can decide to move one step backwards, but here he has to pay no energy costs for making such a move. As said, a player may also decide to rest and recover, and to do so he must discard a tile from his hand. If he discards a room tile, he receives points according to the two exists of the room. Should an obstacle tile be discarded, the player recovers the number of points marked on the tile, and in the case a temple- exit tile is given up the player receives three points of his choice. However, the real fun starts once a player has finished his movement. He then has to check whether there is a row of temple tiles three rows back from the tile he is not occupying, and if this should be the case the tiles crumble and the whole row of tiles is discarded! Any explorers still present on this row turn into ghosts for the rest of the game, but they still can participate and even have a possibility to win. During the game a count is kept of how many times such a crumble has taken place, and only after the third crumble has happened the players are allowed to play an exit tile. However, the third crumble also means that the temple will now collapse even faster, and thus a player now has to roll a dice after his movement. If the result means an additional crumble, a further row of temple tiles may collapse in addition to a row which might already have collapsed due to the three-rows-back rule outlined above. Still, let's not forget why the adventurers have entered the temple in the first place: they wanted to get the two Sun and Moon statutes. At the beginning of the game each of the statutes is assigned one ability marker of each of the three kinds, and whenever a player either pays three energy points to use an exit doorway or enters a tile containing an obstacle he may take possession of one of the two statues. At the beginning of the game the statues are placed aside, but as soon the players have taken possession of one of them the will be handed from player to player if the prescribed conditions are met. A player in possession of a statue may use the energy markers assigned to the statute to pay for using an exit doorway instead of paying with his own energy tokens, and the statues get stronger during the game since each time a player takes possession of a statue he has to place one of the energy tokens he just used onto the stockpile of the other statue. The players can exit the temple through a temple-exit tile, and once out of the temple the playing piece of the player is placed in the jeep where he waits for the game to finish. If the player succeeded in getting out a statue with his character, he may not take back three energy points of his choice, and while waiting for the game to finish he also spends each round resting in the car! For each turn in the car, the player names one of his attributes and rolls a dice, and if he succeeds in rolling higher than his current energy level of the named attribute he will receive an additional energy counter. But before getting to the ending, let us turn back to any poor characters which might have been turned into ghosts. A player has to discard a number of energy counters if his character becomes a ghost, but during their turns the players of these ghosts now may freely move their ghost-characters through the temple to rooms occupied by characters still alive. These characters are haunted by the dead, since a ghost chooses one of the characters in the room, names one of his abilities and rolls a dice. If he rolls equal or less to the adventurer's current energy level of that ability, the ghost will drain one energy from the character and take it for himself. However, the drain also may fail, and in this case it is the ghost who looses one energy while nothing happens to the adventurer. The game ends once all characters either have left the temple or have been turned into ghosts - who may not leave the temple! The game is won by the player whose character/ghost is left with the highest total of energy points, but if there is a draw it will be a living adventurer who wins over a ghost, an early survivor who wins over a later one, and a later ghost who wins over an earlier one. The game features rules in Italian, German, English, French and Spanish, but although the texts are well written there have been one or two possibilities for misunderstandings which needed to be remedied by switching from the German to the English rules and comparing their wording. Once understood, the game is fairly easy to play, and as soon as the race has begun a nice competitive spirit grabs the players who want to get out of this doomed temple as soon as possible. Although each player starts with a temple-exit tile, he will certainly not be able to use the tile very early in the game since the other players keep a system of checks and balances as to prevent an early winner. Here especially the obstacles are bothersome, since they may cost a player quite a lot of energy tokens which he would otherwise have needed to win the game. Some strategic options are available to the players while racing through the temple, but it must also be said that the game certainly puts a high emphasis on the luck factor. Temple tiles are drawn at random, and quite a few decisions are made by a roll of the dice, so that a player might get away lucky and escape with many energy tokens. Still, the layout of the temple needs to get used to, and thus a player needs a keen eye unless he wants to be surprised by an unwanted crumble, and furthermore a player should not feel too certain of victory, since the placing of some nasty obstacles short before his temple-exit may prove devastating on his efforts to win. To sum it up, Krumble! is a nice, entertaining family boardgame which owes a good portion of its attractivity to its nice artwork and the racing spirit created in the game. Keeping this in mind, it is light enough to be played before or after getting down to a heavy-brain teaser, and it offers enough entertainment so that its replay value should not be underestimated. However, some of the the rounds I played went a bit strange, with players getting an early possibility to leave the temple with a very high score of tokens left. This happened despite the fact that such a player was hampered a lot with obstacle cards, and I felt that the rules perhaps need a bit of fine-tuning to reduce the chance of such situations. One possibility is to mix the exit tiles into the deck of tiles instead of handing each player an exit at the beginning of the game. This will force players to stay in the temple longer, and if you couple this change with setting back the distance for a "Krumble!" from three to four rooms there is a major impact on both game length and player's strategy, since it now also becomes a very real option to possibly go back in order to reach an exit played by another player. Well, Krumble! offers some room for experimentation here, and I would recommend to try varying some of these factors to see how the gameplay reacts.